Stephen and Yasmine discovered scuba diving! 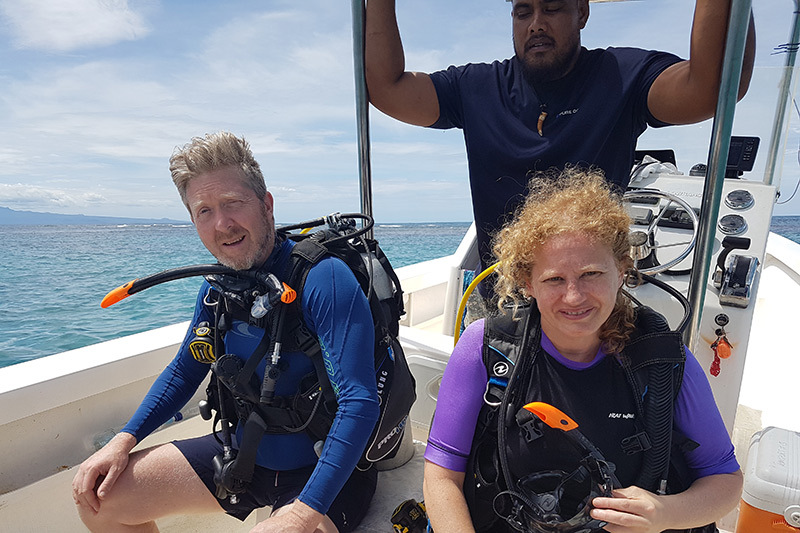 The team at Pure Ocean love taking beginners into the water to show them the amazing marine life just below the surface and their latest candidates were Stephen and Yasmine who completed their PADI Discover Scuba Diving experience. The course was a lot of fun and as well as learning new skills, the pair enjoyed discovering the reefs and spotting a myriad of fish and other marine creatures. Congratulations to you both and we look forward to showing you even more of the dive sites around Samoa on your next visit. You could also further your skills with the PADI Open Water Diver Course! http://www.pure-ocean.com/wp-content/uploads/2018/11/PO_DSD_blog_800x533.jpg 533 800 Lisa Hall http://www.pure-ocean.com/wp-content/uploads/2018/11/pure-ocean-logo-final-nov-2018.png Lisa Hall2018-11-12 11:44:122018-11-12 11:44:12Stephen and Yasmine discovered scuba diving! Congratulations Frank and Chrystina – new PADI Discover Scuba Divers We’re in safe hand with Ta!